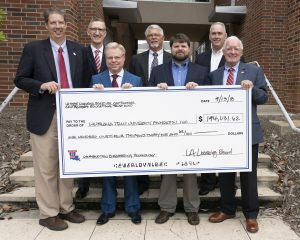 The Contractor’s Licensing Board and the Contractors Education Trust Fund (CETF) have donated nearly $200,000 to the Louisiana Tech University College of Engineering and Science. Pictured are (from left) Dr. Hisham Hegab, Danny Graham (Licensing Board), Art Farve (CETF, Associated General Contractors), Garland Meredith (Licensing Board), Dr. John Matthews (TTC), Michael McDuff (Licensing Board), and Vic Weston (Licensing Board, CETF, Louisiana General Contractors). The State Licensing Board for Contractors for Construction Engineering Technology Programs donated $94,031 to the Construction Engineering Technology program, while the CETF made a $50,000 donation to support the program and another $50,000 donation to the Trenchless Technology Center (TTC). State representatives from the Associated General Contractors of America, the CEFT, the Louisiana General Contractors and the Licensing Board presented the check to Dr. Hisham Hegab, dean of the College. While the donations to the Construction Engineering Technology program will help the College continue to provide innovative education to students within the program, the donation to the TTC will help fund a portion of the Underground Infrastructure Campus (UIC), the Barbera Underground Infrastructure Research and Training (BUIRT) facility project. “The TTC is excited about the donation to our BUIRT project, which will be used to enhance the University’s commitment to construction education and to further develop the workforce in the area,” Dr. Tom Iseley, associate director of TTC international operations, said.